Luke had a lot of fun with this new Monkey toy! *Disclosure: We were compensated to share the mini mystery box for dogs from That Daily Deal. All opinions are our own. This post also contains affiliate links (see sidebar). The Outward Hound Bottle Squeaker Toy* came to us inside a Mini Mystery Box for Dogs. For only $9.99 per month you can get this fun little box with just one toy and at least one treat (all made in Canada or USA). We received two vegan treats – a Vegalicious Healthy Treat Bar* and Healthy Food Enhancer (food topper). We’ll take you someplace special! Luke points out that monkeys are not on a vegan diet, so even though the K9 Crew will never be vegans, they’re always willing to give new things a try! The food topper was fun – it comes in a bottle that lets you grind it right onto their food. They really seemed to enjoy that small addition to their regular kibble. The tunnel is where we take our toys to …. just nibble on! 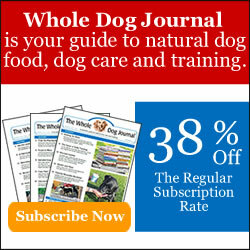 That Daily Deal is a sister site to Pet Treater, who we have enjoyed doing many reviews for in the past. Just click here if you’d like to give it a try! It’s a fun way to get to try something new without having to subscribe to a big box that might give you more items than what you need. Haha he takes them to the tunnel to keep away from cricket, and to nibble on so he doesn’t get caught. Nothing beats a monkey in the tunnel! Oh Luke, you sure are enjoying that, even in the hot tunnel! Gotta be hot in that tunnel. Still bitter that my Boys would never use ours. It always looks like so much fun when I watch other dogs enjoying theirs. Can’t imagine wanting to sit in a tunnel on a hot day. Perhaps Luke was worried about competition? Looks like Luke is really enjoying that toy. It looks like Luke enjoyed the company of his monkey toy! I also like the mini-box idea. If I can’t use the treats, I can always donate them to the shelter via our vet’s donation bucket. Have a great day my friends!! Our shelter has boxes at all the grocery stores, so it makes it really convenient! I think he kind of likes it! Well done, Luke. You and Elsa seem to know exactly what to do with treats, er make that stuffies. In either event…munching them seems to de rigueur with stuffies. Have a blast with your monkey, Luke! Even Cricket has liked this one, and she’s far more particular about toys. The bottle inside it is flattened now though, but it’s still in one piece! Looks like Luke had a lot fun with that monkey! I like the idea of a smaller subscription box that’s more affordable and doesn’t overwhelm you with stuff. As much as we loved it, we were getting overloaded with stuff from the Pet Treater boxes. They can be so hit or miss with toys, and I now have a box full that they never play with (everything is great when it’s new, but in time they seem to lose interest).